Let the awesome magic of Spencer Art Posters draw attention to your event or happening. Whether it's a Book Cover or Concert Promotion, Spencer Art will produce the most eye-catching poster art available today. 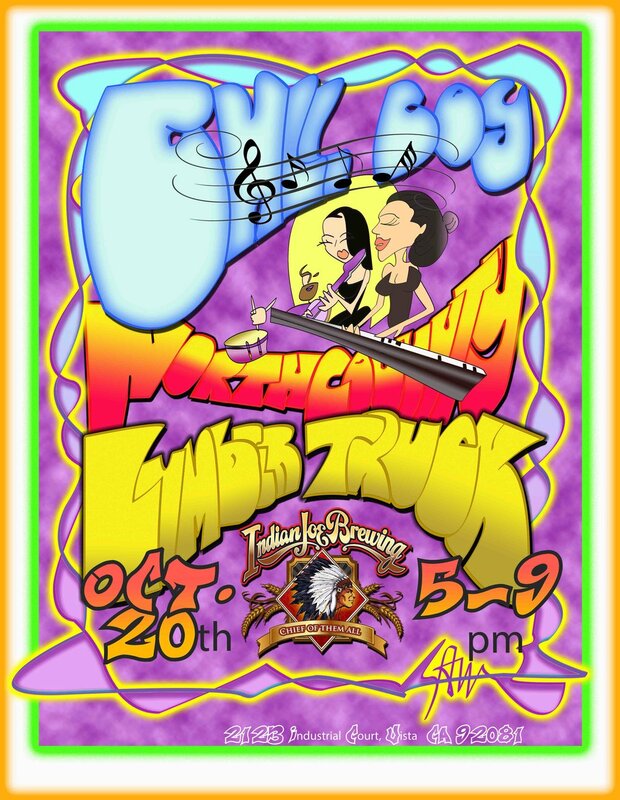 This Spencer Art poster great was completed for the band North County Lumber Truck of Encinitas, California. In a lot my poster art I mix a bit of Squiggle Art (hence the frame) in retro of my studies/analysis of the Family Dog Poster Art from San Fransisco. (http://www.familydog.com/artists). Squiggle was a name I garnered in high school from the Art Nouvaeu style of my works. (Didn't know what the term Art Nouvaeu meant at the time- realized it later in college art history classes.) To find out more about Art Nouveau visit: http://en.wikipedia.org/wiki/Art_Nouveau. My first commissioned poster art piece for a well know local business: Truck Covers USA. Nills, the owner never knew what he was getting himself into when he hired Spencer Art to do a logo for his company. When I first handed him a version of the completed piece, he didn't know what to say except " I have my design team look at this one." A day later- he text-ed me: " Yes! It's a go! We want a 144 pieces!" ( pieces meaning mugs for which the art was printed on for promo purposes. Cars/trucks are probably one of the difficult things to draw besides human faces and hands.